Qasim al Raymi has released his first audio message as the new emir of Al Qaeda in the Arabian Peninsula (AQAP). Al Raymi became the head of AQAP after his predecessor, Nasir al Wuhayshi, was killed in a US drone strike in mid-June. His message has been translated by the SITE Intelligence Group. Al Raymi reaffirms his allegiance to “the eminent sheikh, the beloved father,” Ayman al Zawahiri. He repeats the bayat (oath of allegiance) that other al Qaeda commanders and members have sworn to Zawahiri. “I pledge allegiance to you, to listen and obey, in times of difficulty and prosperity, in hardship and in ease, to endure being discriminated against and not to dispute about rule with those in power, and to wage jihad in the cause of Allah the Almighty,” al Raymi says to Zawahiri, according to SITE’s translation. Al Raymi adds that his “pledge is from me and on behalf of all my brothers in” AQAP. He offers his condolences for the death of Wuhayshi, who doubled as al Qaeda’s global general manager, and vows that the fight against the US will go on. “All of you must direct and gather your arrows and swords against [America],” al Raymi says in lines addressed to the “mujahideen” around the world. AQAP’s leaders have repeatedly argued that the US is partnering with Shiites throughout the Middle East, including the Houthis in Yemen, against the Sunni jihadists. And al Raymi repeats this claim, saying the US and the West need the Shiites “to be the shield to protect them from the strikes of the mujahideen, and a tool through which they subjugate the Sunni people.” Al Raymi praises the recent advances made by the Jaysh al Fateh coalition in Syria, which is led by the Al Nusrah Front and its allies. Jaysh al Fateh is at war with Bashar al Assad’s Alawite regime and Iranian-backed Shiite forces. Al Raymi also addresses “our captives” who are detained around the world, including at the US facility in Guantanamo Bay, Cuba. He promises they have not been forgotten and AQAP will fight to release them from their captivity. Al Raymi’s continued allegiance to Zawahiri is not surprising. Intelligence collected by US officials shows that he was trained by al Qaeda in pre-9/11 Afghanistan. He was chosen to participate in a thwarted plot to assassinate the US ambassador to Yemen in 2002. Al Raymi was imprisoned for several years, but broke out of prison in 2006. In the years since, according to the State Department, al Raymi has “played an important role in recruiting the current generation of militants making up the Yemen-based AQAP.” Indeed, alongside Wuhayshi and other al Qaeda loyalists, al Raymi helped rebuild AQAP in Yemen after a series of devastating counterterrorism operations inside the Saudi kingdom. 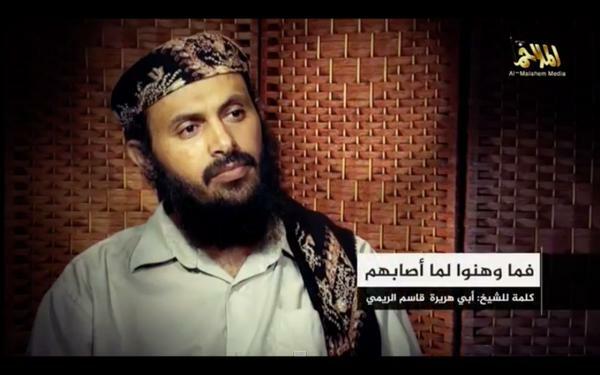 Prior to assuming the top position in AQAP, al Raymi served as the organization’s most senior military commander. This means he was in charge of AQAP’s day-to-day operations inside Yemen even before becoming the group’s overall emir. Some supporters of the Islamic State, al Qaeda’s jihadist rival, previously spread rumors suggesting that al Raymi was going to swear allegiance to Abu Bakr al Baghdadi. Al Raymi had received training from Abu Huda al Sudani, an al Qaeda veteran who defected to the Islamic State. And so, some of Baghdadi’s supporters have argued, al Raymi would follow suit. These rumors had no basis in fact. In all likelihood, al Qaeda had little to fear when it came to AQAP’s line of succession. For instance, shortly after AQAP confirmed Wuhayshi’s death on June 16, a longtime jihadist media operative known as Shaybat al Hukama reappeared on Twitter. (Al Hukama’s Twitter feed has been suspended on multiple occasions in the past. It has since been suspended again.) Judging by his online connections and detailed knowledge of al Qaeda’s operations, Al Hukama probably serves an important role in al Qaeda’s media arm. His nom de guerre means “the eldest of the wise,” which is a tribute to Zawahiri, who is often referred to as the “wise man” of the Muslim nation. Therefore, when al Hukama suddenly started tweeting again in mid-June, it was likely to relay messages on behalf of al Qaeda’s senior leadership. In his second tweet back, Al Hukama said Ayman al Zawahiri and his subordinates will continue to lead the jihadists “revival,” or “resurgence.” Al Hukama said this was the duty of each of al Qaeda’s regional emirs: Abu Muhammad al Julani (the head of the Al Nusrah Front in Syria), Ahmad Abu Obeida (the head of Shabaab in Somalia), Abu Musab Abdel Wadoud (otherwise known as Abdelmalek Droukdel, the emir of Al Qaeda in the Islamic Maghreb), Asim Umar (who heads Al Qaeda in the Indian Subcontinent), and AQAP’s al Raymi. Al Hukama’s tweets were defiant, arguing that the death of senior al Qaeda leaders would not end the organization’s jihad against the West and its allies. The tweets were also intended to convey a simple message: Zawahiri maintains a network of loyal followers around the globe. In some ways, Al Raymi’s reaffirmation of his allegiance to Zawahiri proves al Hukama’s point. Despite the Islamic State’s challenge to al Qaeda’s leadership of the jihadist movement and the loss of key lieutenants in the ongoing war with the West, Zawahiri still commands a network of loyal subordinates. I also think IS and al Qaeda will reunite over time and those threads you mention will make the unification smooth and simple. I think the casus foederis will be an imminent collapse of the Islamic state. al qaeda always it seems, has its hand out ready to repair the relationship and reunify (as the managing partner). The islamic state, not so much. I think as things turn south for IS, as they eventually will (or arguably are), Nusra and ahar al sham will pick up some of its fighters and help others to flee. Nusra and ahar, fattened on Qatari oil profits, will have the tablecloth of plenty spread open for the flies to gather at. Another possibility is a decapitation of leadership in either organization. Might as well say you are claiming allegiance to the receiving end of a Hellfire missle; enjoy! Al Qaeda hates ISIS for crossing moral lines, as they said. They are two very different groups. There has been nothing like ISIS, and they are the worst of the worst. I’m very concerned about Obama , not focusing enough on ISIS, because he’s focused too much on the past. There’s an article about the dispute between Al Qaeda and ISIS.